DJ TOBY CHICAGO IS HAVING FUN ON BUMPS RADIO ENGLAND! 9 PM MOUNTAIN, AND 8 PM PACIFIC! ON TUESDAYS & THURSDAYS AT 0400 HRS. UTC! ALL OF MY SHOWS ARE RECORDED AND ARE ONE HOUR LONG EACH UNLESS A SPECIAL-LENGTH SHOW HAS BEEN PREVIOUSLY ANNOUNCED! BE SURE TO CHECK MY TOBY CHICAGO FACEBOOK PAGE FOR INFORMATION ON "THE SPOTLIGHT INDIE ARTIST OF THE MONTH"
PLUS - DJ TOBY CHICAGO IS NOW A CLIENT OF 910 PUBLIC RELATIONS! ​AIR - ATOMIC RADIO - A NEW STATION FORMAT LAUNCHED FEB. 2018! ALL ABOUT toby chicago, internet dj! Toby Chicago playing her Yamaha DT 9-Xpress Electric Drums (tuned to sound acoustic!) at a coffeehouse gig. She also plays rhythm guitar and favors Gibson Cherry-Red SG's. She sings too! 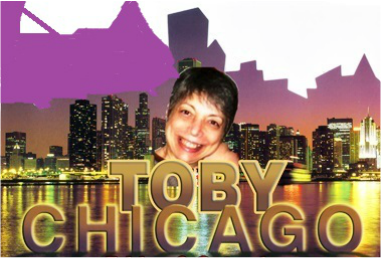 TOBYTOTOBY CHICAGO, INTERNET DJ, eternally young-at-heart, began her radio career back in the 1970's as an Undergraduate at a private college in The Pacific Northwest. After Graduate School and then teaching Speech Communication and Debate at a state university (she can still successfully argue both sides of a question!) she was the "Monday Night Trivia Lady" on a major Northwest radio station where she specialized in Classic Hollywood, Old Time Rock and Roll, The Beatles, British Invasion Music, American History, and Historical Britain. "Rumor Has It" there is a European Title in her background - meaningless in The USA but fun nevertheless! On a first-name basis with numerous foreign and domestic notables (nudge, nudge - wink, wink! ), Toby Chicago knows of whence she speaks! READ THIS INTERVIEW PUBLISHED ONLINE IN RADIO.ABOUT.COM IN AUGUST, 2015 TO FIND OUT HOW TOBY CHICAGO'S INTERNET DJ CAREER STARTED! READ ABOUT HOW IMPORTANT INDIE MUSIC AND MUSICIANS ARE TO HER - AND HOW MUCH SHE LOVES HER LISTENERS AND BUMPS RADIO ENGLAND! UPDATE JANUARY 2018: ABOUT.COM HAS BEEN PURCHASED AND NO LONGER ARCHIVES OLDER ARTICLES. IF YOU WISH A COPY OF THIS INTERVIEW, PLEASE CONTACT DJ TOBY CHICAGO DIRECTLY USING THE CONTACT FORM ON THIS SITE. ​Thanks to this interview and her record-breaking listener base, Toby is now considered a "Top Echelon DJ" on the entire Internet! Toby Chicago has lived in The Pacific Northwest over 40 years, has some political and military service under her belt, and "finally" discovered Indie Music - which she finds she likes a whole bunch! As a garage band musician for more than 40 years Toby Chicago takes a personal interest in Indie Musicians who wish to expand their audience to an international level and gives them as much airplay as legally possible on her internet radio shows. Toby Chicago is "The Internet's Fastest-Rising DJ!" Literally heard all over the planet via internet radio, Toby Chicago has gained the reputation of being a good friend to Indie Musicians everywhere! Tune in to her shows to find out why every week more and more people are tuning in to Toby Chicago's Indies and Oldies Show and Bumps Radio Ballroom Show. TOBY CHICAGO BROKE A STATION RECORD ON 27 FEB 2015 WITH A VALIDATED LISTENING AUDIENCE OF 68,313 PEOPLE! OTHER INTERNET RADIO STATIONS (INCLUDING ONE OF THE LARGEST) ASKED HER TO JOIN THEM BUT TOBY CHICAGO SAID NO! Vinnie Zummo, The Del Zorros, Chuck Eaton, Vegas With Randolph, The Jellybricks, Jeremy, Gary Pig Gold, Smiling Jack Smith, and Stevan B.! Single again (HEL-lo! ), Toby Chicago lives with her studio engineer (her Havana Brown Cat!) and is fiercely loyal to her "Intentional Family" of True Friends. has been known to travel locally when possible to have a cup of coffee and a chat in-person with a listener or two or three! (North America/Western Hemisphere) - Mondays and Wednesdays at 11 PM US Eastern/10 PM Central, 9 PM Mountain, and 8 PM Pacific. (UK/Europe/Eastern Hemisphere) - Tuesdays and Thursdays at 0400 GMT (Greenwich Mean Time). PLEASE NOTE that the time difference is responsible for the shows airing "on different days." On Mondays/Tuesdays you will hear Toby Chicago's Indies and Oldies Show and on Wednesdays/Thursdays, Toby Chicago's Bumps Radio Ballroom Show. Show days and Times are listed near the top of this page.